Last year Jordan Spieth made history with five PGA wins, including two Majors and the FedEx Cup, for over $20 million in earnings as a 22-year old. Can he repeat that performance this season? 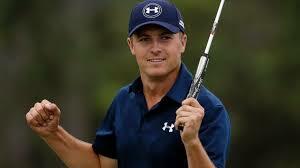 Well, against the other Tour winners in a high profile tournament in Hawaii last month he won by eight strokes. That's pretty convincing. A few more tournaments around the world and he has only finished occasionally in the Top Five. So he doesn't win them all, but he is still No. 1 in the World Golf Rankings in spite of pressure from Rory McIlroy, Jason Day and Ricky Fowler. Spieth is a year older and wiser with lessons learned from winning under pressure last year. He will be tough to beat. We will be watching at the Masters in April. How is that like business? One year is not enough. Each year you start again from zero and try to repeat your best performance. No one is very impressed unless you can sustain it. Consider Phil Mickelson - challenging himself and the competition for twenty-five years with forty-two wins including five Majors and still in the mix to win again until the last putt on the 18th green at Pebble Beach last Sunday. He has already won the Masters three times (2004, 2006, 2010), so maybe the 45-year old will be duelling with Spieth in April. It will be fun to watch.